George Graham Reviews Honeydogs' "Here's Luck"
Groups influenced by the Beatles tend to make cyclical appearances on the music scene. It seems that every few years there is another little flurry of activity from emerging bands who owe much of their sound to the Liverpool Lads. With a Beatles compilation album continuing to ride high on the charts, this would seem like a good time for another round of Beatle progeny to appear, given the fad-oriented nature of the commercial music business. Indeed this week we have a fine new release by a group who borrows not an inconsiderable amount from the style of the Fab Four. But interestingly, it's by a group that has been around for over a half-decade, and it's an album that was actually made nearly three years ago but not released until now due to the machinations of the record business. It's the new fourth CD by the Minnesota-based group called Honeydogs, which they titled Here's Luck. Honeydogs were formed by 1995 by brothers Adam and Noah Levy, along with bassist Trent Norton. Adam is the guitarist and songwriter, while Noah plays drums. Their independently-released emponymous debut CD in 1995 gained a fair amount of attention in their home base and had the group taking a kind of alternative country direction. But they began to explore other stylistic avenues in their followup Everything I Bet You before landing a major-label contract to release the Seen a Ghost in 1997. Their new album almost didn't happen. With their record label about to be swallowed up in a mega-merger, and their original guitarist Tommy Borscheid parting ways with the group, bassist Trent Norton suffered a near-fatal athsma attack that left him on life support for three days. But Norton soon bounced back, and they were given the OK for a new album by their label, so they started work in 1998 with producer John Fields. They were joined by new members Brian Halverson on guitar and Jeff Victor on keyboards. Songwriter Adam Levy also decided to take a different direction lyrically, straying from the sometimes confessional love songs that dominated his previous work. They jumped headfirst into some of their main influences, including the Beatles, the Kinks, Elvis Costello and NRBQ, and created a beautifully-crafted album of sophisticated pop with bittersweet, often ambiguous lyrics that can contrast with the upbeat melodic sound that at times conjures up the arrangements on Sgt. Peppers or Magical Mystery Tour. 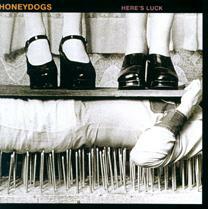 But after creating Here's Luck, Honeydogs found themselves in record company limbo -- not dropped by their label, but, as they say, ignored, their album not released for over two years. Though they played live some, it did keep the group out of the spotlight for a long time. Thirty-six-year-old group-leader Adam Levy, father of two children, continued in his regular full-time non-musical job of social worker in a school for immigrants. Honeydogs eventually decided to pull out of their deal with Mercury Records and were eventually signed to Ryko-Palm, which agreed to release Here's Luck, but their new label also decided to put the album on hold for a while as they developed a promotional plan for the record. But nearly three years after it was made, Here's Luck is finally out, and it turns out to be a gem of first rate songwriting, great arranging and cleverly retro production that evokes Merseyside memories from those old enough to have been there the first time, and the neo-psychedelic cool that has been attracting Generation Y. Producer Fields and the band capture the mood of the Sgt. Peppers-era Beatles with ingredients like the quirky, George-Martin-inspired string arrangements, some Ringo-like drum lines, bouncy McCartney-esque piano parts, a Lennon-inspired vocal, and even a hint of the Eastern influence that was a favorite of George Harrision. But they use their Beatle-ana as accents, not as their sole direction, so that Honeydogs' own sound is not subsumed, as has happened with other groups like Jellyfish from a few years ago. After starting as a country-influenced roots rock band, Honeydogs, on their newly released CD Here's Luck, turn their attention to Beatles-influenced pschedelic-pop as their principal direction. One might be tempted to call them another in a continuing series of Beatles-acolyte bands to come along over the years, especially now with the original recordings by the Fab Four enjoying such great commercial success. But while the influence of the Beatles can clearly be heard, Adam Levy's writing is first-rate on its own and the musicianship and production of this album are so good that it makes it a class act, regardless of their sources of inspiration. From an audio quality standpoint, the album is also top-drawer. The elaborate production techniques and clever use of effects are impressive. It makes great listening on a good stereo system, though the album spends a bit too much time in the loud range, when the use of dynamics could have been a bit more effective. Sophisticated pop like the Honeydogs new album, while it hints of another era, has become timeless in its own way. And this Midwestern group has become one of the bright lights on the scene, likely to appeal to listeners across generations.